It is funny how stories sometimes find their way to me. At Thanksgiving dinner, a friend asked if I would research the land history of her parent’s house. I thought in all likelihood I would find the old aerial photos of Western Boca Raton along State Road 7/441 showing the land underwater and unused, being that far west. I was wrong. The first aerial photo in 1947 showed the area in the vicinity of State Road 7/441 and Judge Winikoff Road to be all subdivided into neat little squares. I then found the present legal description of the properties, and the records indicated that the land was originally platted in 1911 – in plat book number 1 of Palm Beach County. What on earth were people doing out there in 1911? The original plat provided the first clue. A company called “The Florida Fruit Lands Company” had subdivided the land into three large plats. The land tracts were in varying sizes from 10 acres to 640 acres, and I could see these were substantial holdings, entire sections and miles of land. A Google search of The Florida Fruit Lands Company told the never-ending story of American ingenuity, greed and dashed hopes. 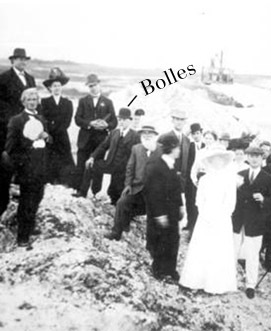 The Florida Fruit Lands Company was owned by Richard J. Bolles, a New Yorker born in 1843 and a real entrepreneur. At age 23, he was already a member of the New York Stock Exchange. He went West, as many young men of his time did, and bought vast land tracts in Colorado and Idaho, and subdivided the land on a promise that irrigation would be provided…but that never happened. the Everglades drained to provide a spark to the post-Civil war blues from which the Florida economy suffered. The men cut a deal so that Bolles would agree to buy 500,000 acres of swamp, 180,000 of which were in Broward and Palm Beach Counties. He paid the state $2 an acre, and the state agreed it would pay to have the land drained through the digging of canals. Bolles had a real knack for sales, and sent salesmen all over the country to tout the Florida Paradise armed with pamphlets that showed how wonderful and easy Florida farming would be. The Midwest area in Missouri was especially targeted by Bolles’ men. A New York Times article in 1912 reported that the land was cut into 12,000 tracts – two tracts of 640 acres (1 square mile), eight tracts of 320 acres, 20 of 160 acres, 100 of 80 acres, 250 of 40 acres, 8,620 of 20 acres and 8,000 of 10 acres. Each person had to pay the salesman $240 (equivalent to $5,500 today) to buy a chance at a drawing to see what track you would get and its location. Whatever tract you ended up with, the price was $24 per acre, so Bolles was to make twelve times his original purchase price. In addition, each “winner” would receive a free town lot in a proposed town called Progresso, to be located just north of where Fort Lauderdale is today. The town was platted, complete with schools, shops, factories, churches and lots. This filled in a piece of my own puzzle as my grandfather once owned hundreds of lots in Progresso that he bought for 2 or 3 dollars a piece during the Depression. Bolles running an illegal lottery, but he beat those charges as well. Bolles was allowed to keep the $1.4 million he had already collected, so he did profit on the deal. He sold some holdings in Palm Beach and Broward (J.F. Scullen bought 113,000 acres in 1919), and let the rest revert back to the state (large holdings around Lake Okeechobee). He died in 1917, while aboard a train in Palm Beach. 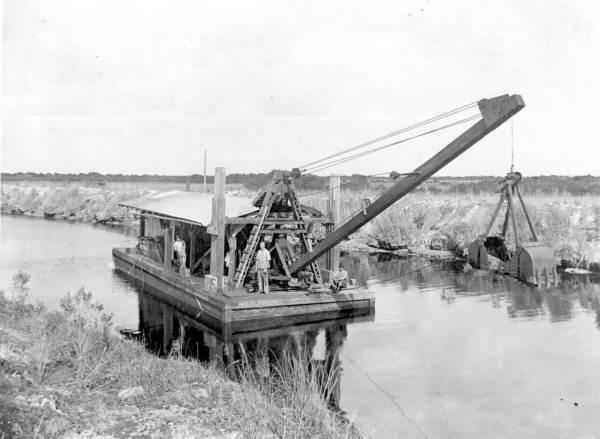 Thus, Palm Beach County’s first land boom had come to an end. Eventually, the land was drained (not until the 1930s) and many dairys and large vegetable farms were located on the lands until the 1970s, when housing developments began in earnest. The people who bought the land had that dream of either making fast money by flipping the land, or actually wanting to start a farming enterprise. Innocent dreams are what tycoons like Bolles feed upon, and they exist in all times. The games may be different today, but the winners and losers are the same. Notes: This story was researched through the New York Times archives, a web page at http://everglades.fiu.edu/reclaim/bios/bolles.htm and the book “The Swamp – The Everglades, Florida and the Politics of Paradise” by Michael Grunwald. The book is a rich history of the Everglades and the attempts to kill and then revive this one-of-a-kind ecosystem. Where did you find aerials from 1947? Have you seen aerials other the common 1953,1964, 1968 and 1975? Are they available for the whole county? They are online at the University of Florida. The number and years available vary by where you are searching. The land in West Boca was the first time I had come across the 1947 aerials. Is this really the first aerial photo in 1947 showed of this place..kinda interesting to know the history of the place..